Production Details A cDNA encoding tamoxifen inducible Cre recombinase (CreERT2) followed by SV40 polyadenylation signal was introduced into the start codon of Prox1 in BAC clone RP23-190F21 using homologous recombination in bacteria. 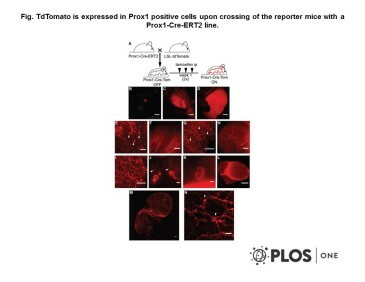 The construct was validated by PCR and Southern blot analyses, and used for pronuclear injection into fertilised mouse oocytes. Two founder lines were generated and tested by timed matings with Cre reporter strains, followed by 4-OHT administration, for specificity and efficiency of Cre-mediated recombination. One of the founder lines that gave efficient recombination in all Prox1-expressing tissues was kept for further studies. There are 18 reference entries for this reagent. Bianchi et al. 2015. PLoS One. 10(4):e0122976. PMID: 25849579. Martinez-Corral et al. 2015. Circ Res. 116(10):1649-54. PMID: 25737499. Rouhani et al. 2015. Nat Commun. 6:6771. PMID: 25857745. Roles of lymphatic endothelial cells expressing peripheral tissue antigens in CD4 T-cell tolerance induction. Nonvenous origin of dermal lymphatic vasculature. Park et al. 2014. J Clin Invest. 124(9):3960-74. PMID: 25061877. Aspelund et al. 2014. J Clin Invest. 124(9):3975-86. PMID: 25061878. The Schlemm's canal is a VEGF-C/VEGFR-3-responsive lymphatic-like vessel. Lymphatic regulator PROX1 determines Schlemm's canal integrity and identity. Tatin et al. 2013. Dev Cell. 26(1):31-44. PMID: 23792146. 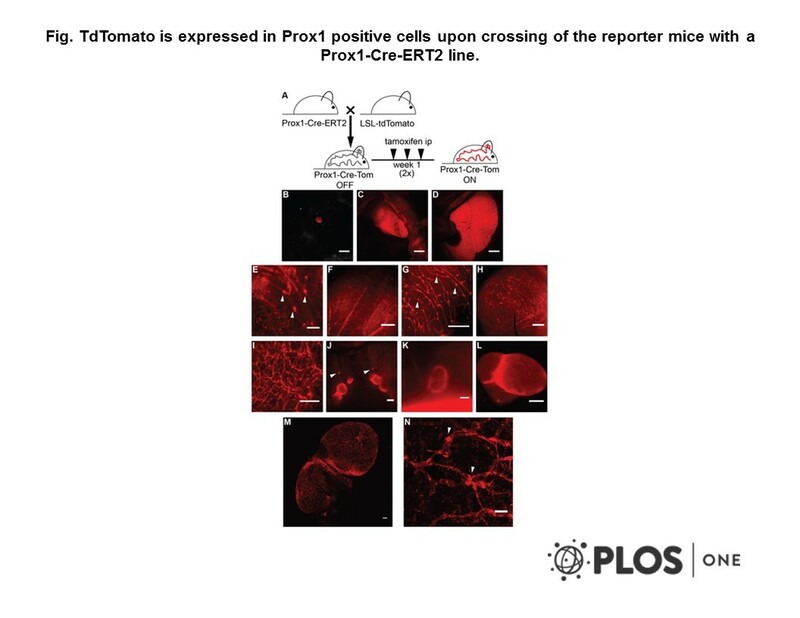 Planar cell polarity protein Celsr1 regulates endothelial adherens junctions and directed cell rearrangements during valve morphogenesis. Chen et al. 2012. J Clin Invest. 122(6):2006-17. PMID: 22622036. Blood flow reprograms lymphatic vessels to blood vessels. Sabine et al. 2012. Dev Cell. 22(2):430-45. PMID: 22306086. Mechanotransduction, PROX1, and FOXC2 cooperate to control connexin37 and calcineurin during lymphatic-valve formation. Bazigou et al. 2011. J Clin Invest. 121(8):2984-92. PMID: 21765212. Genes regulating lymphangiogenesis control venous valve formation and maintenance in mice.